From left to right: Don Rath, Synopsys Inc.; Patrick Evans, TEI; Eric Johnson, Ross Stores Inc.; Stephen Dunphy, Ross Stores Inc.; Katrina Welch, Texas Instruments Inc.; Robert Howren, BlueLinx Corporation; and David Stevens, Cook Inlet Region Inc.
On March 30, 2017, members of TEI’s financial reporting committee met with a delegation of Financial Accounting Standards Board (FASB) members and staff, marking the first face-to-face meeting between TEI and the FASB and accomplishing an Institute goal spearheaded by TEI’s current international president, Janice Lucchesi. 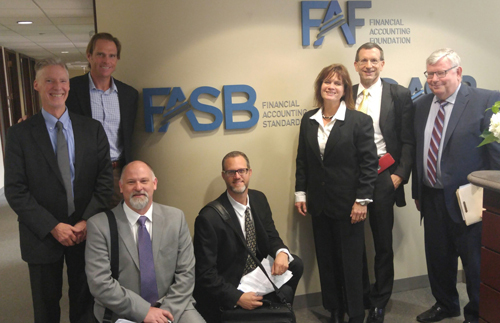 The TEI group, led by Eric Johnson, current chair of TEI’s financial reporting committee, engaged in a constructive dialogue with FASB representatives concerning the FASB’s current exposure draft on income tax disclosures, tax reform, and other matters of interest to the group. TEI’s views were well received and established a strong basis for future meetings with the FASB on issues of mutual interest.